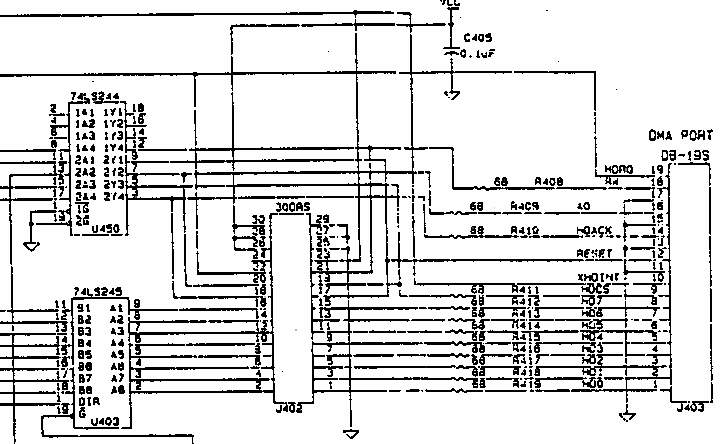 If want to connect some ACSI device internally, then need to connect to even data pins 2-4-6...16 in case that no internal adapter + connect all control lines, according to schematic. Of course, then no need to shortcuts. If together with internal adapter, then need to connect data lines to odd pins on J402 1-3-5-....-15. Control lines same as without int. adapter. Internal ACSI/SCSI adapter limitations: max accessible capacity is 1GB . 1GB limit is result of fact that adapter allows sending of 5 bit SCSI commands only. Those are commands with codes 0-$1F . My idea was to allow sending of 6-bit commands. With help of schematic of similar adapter, lot of patience and experimenting I did it. Now, very large drives are accessible - in theory up to 2000GB, but biggest one what I have is 18GB, and it works fine. 2 reconnections on board are required. right in middle is mark A (red) - there need to cut pcb. line between pin 5 of IC and hole. Down by ACSI PAL need to bend pin 6 of PAL chip so that it will go out of socket, and connect it with pin 3 - mark B. A expands commands on 6 bits. B ensures that adapter will activate regardless of state of bit 5 by command phase. There is 2 problem by this solution: TOS 2.06 locks SCSI drive when it autoboots not . It will happen only once - before installing autoboot driver (from floppy), but hard drive must became ready to allow driver install. 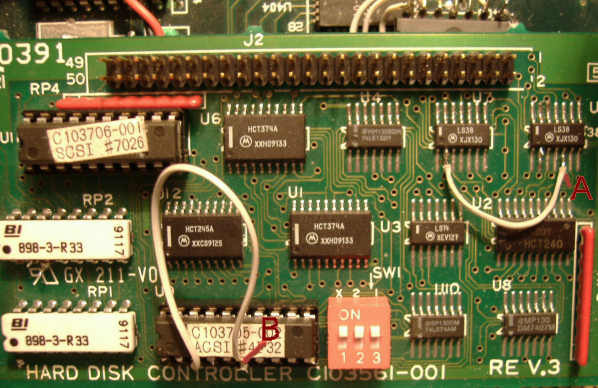 Solution is to connect button (taster) between SCSI reset line (pin 40) and GND. Pressing it will reset SCSI drive and it will work. Then may install autoboot driver. After it drive lock will not happen, even when disable driver autoload (with ALT key) - I added some code in loader which prevents drive lock. It is possible to use some other, external ACSI adapters with this - if they can be set to some other ID than 0. So, Satandisk, UltraSatan. Need to set them to 4-7 . Most of modern SCSI drives works only with parity on - I saw only IBM drives where parity can be disabled. In praxis it means that such drives will not work with our adapter. Solution is again simple and cheap: adding 74HCT280 parity generator chip to board. 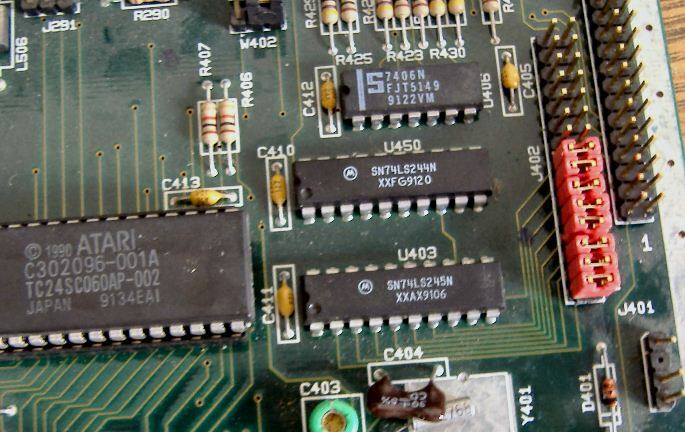 On pic, chip is half visible near to pins 1-2 of SCSI connector. I put it there, because could solder 6 data lines directly to board. So modified adapter will work with existing drivers (Hddriver, ICD, AHDI), but still only up to 1GB. Partition drive on PC, use on ST and PC - easy file transfer. Requires BigDOS (included). 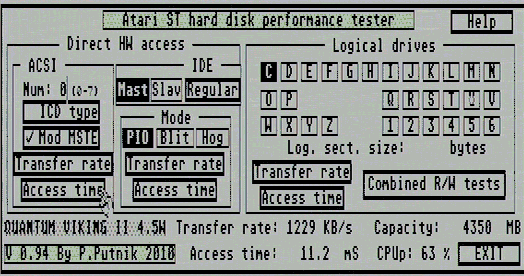 Handles up to 14 partitions on SCSI disk via modified ACSI-SCSI adapter in Mega STE. 2000GB max accesible on drives - using SCSI commands Read(10) and Write(10) with 32-bit LBA addressing . Max FAT16 partition size 2GB - boot partition 1GB . Any partition may be selected to be C (boot partition) by booting - put games on one part, Mint on another - easy switch. Option for HOLE creation by driver loading - better compatibility with some old games. Speed is up to 1000-1250KB/sec depending from adapter and attached drive. No support for removable drive change without restart. Now can work together with Satan, UltraSatan. Accessing 11GB FAT32 partition under Mint with modified adapter and SCSI drive. Testing with new performance test util . P. Putnik, October 2007 - Okt. 2010.